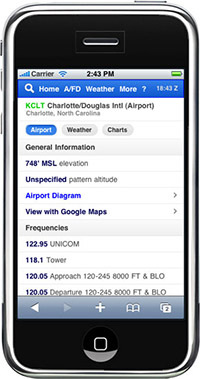 But my memories were correct — it's more than seven years since I started using Foreflight, and just over seven years since I reviewed it here on YAFB. Re-reading that review brought it all back — not just Foreflight in its first (and rather different) incarnation, but also the iPhone experience itself back then (primitive, limited, but showing potential — sort of like Foreflight in those days, for that matter). Tempus fugit, and all that, I guess, and I take both the iPhone and Foreflight for granted nowadays. But I still don't get nostalgic for old gear or stuff like this — that little iPhone can do a hell of a lot more than probably all the computers available to me in the Electrical Engineering department back at university all those years ago could do (and at one-ten-thousandth the cost, I'll bet), and Foreflight can also do a hell of a lot more (and more usefully) than that first edition (for a similar sort of cost). Now if only the other parts of my aviation world could advance as quickly and increase the bang for the buck as rapidly as these two have over the past seven years….